The need to create is eternal and divine. When providing creative opportunities for children it is tempting to expect a frame worthy result or a recognizable completed piece. Read stories to your children and sooner or later you will see those tales woven into the children’s play. Legends, myths and folktales provide some of the most fertile ground for playing pretend. Additionally, the international treasury of stories from these genres forms an intriguing portal to a lifetime interest in cultural geography. You made it to round three! I'm so happy! This one will be awesome. You'll see. Today's post is going to complete our Human Body series. I will continue by giving you even more hands on science experiments to do with your kids. So, put on your goggles and lab coat and let's get started. This picture got a lot of likes on my facebook page and it was really the easiest experiment to do. You need two things: red or pink play dough and a bowl. First you get a small bowl. The larger the bowl the more brains you will have to make. Maybe you want to be ambitious and use a bowl that will fit your child's head, go you! Next, Cover the bowl with the play dough since some of it will show through. Then, roll the remainder play dough into snakes. It doesn't matter how long your snakes are. You will need a variety of sizes but they all should be about the same thickness. Start by bending the snakes into S shapes. Take a look at the pictures to get a general idea. There is no wrong way here. The hardest part is getting the snakes to stick well enough on the bowl. If you wanted to, you could try gluing them. It took days for mine to harden and then pieces would fall apart. I wasn't really expecting it to last too long so it was not a big deal to me. If you want to keep yours, maybe try modge podge glue over the whole thing when you finish. If you have a suggestion that worked for you and want to share with others, leave it in the comment section below. Here is the link I used for the idea though I simplified it. The brain was originally listed as a Halloween decoration! Double uses here people! Here is a link for DIY play dough but since cream of tartar costs just as much as buying ready made play dough, it may not save you money if you are only making one. 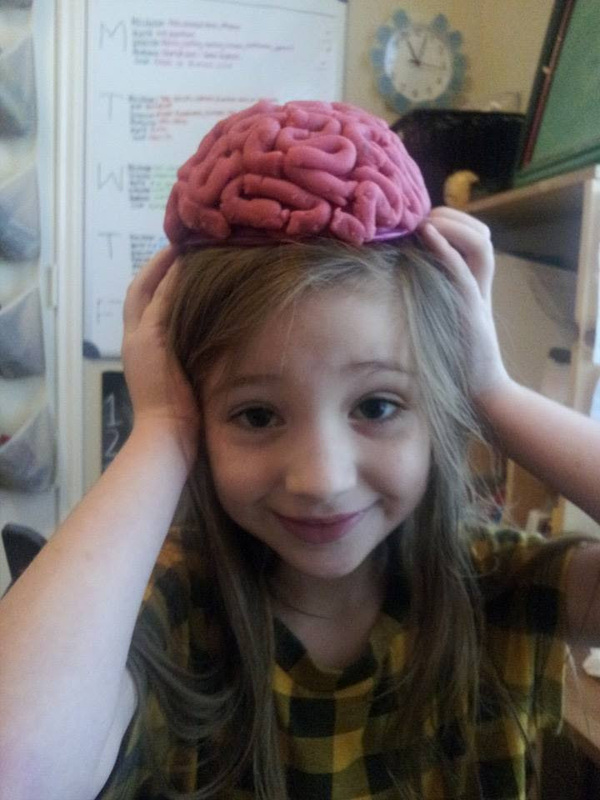 I think one can of play dough per brain should be enough if the brain is not too big. Also, there are tons of different recipe ideas if you want to make things like Chocolate or cotton candy play dough. Here is another activity we did for the brain. I drew an outline of the brain myself and then sectioned it off. It may be easier to print it out. Use card stock if you want to use play dough. Otherwise you can just color it in. 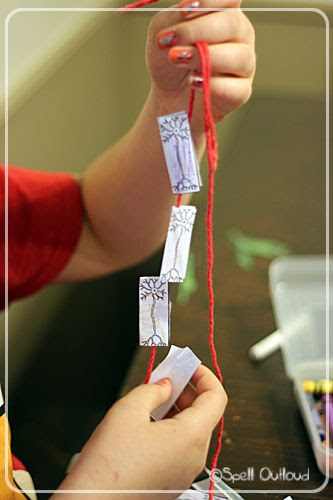 Here are some additional ideas that go along with learning about the brain. Lets see, what else did I promise from last week... Oh yeah, lungs! Here is the link I followed from Pinterest. This lung experiment took more planning than I wanted but still it was easy enough. I took a video of it to show people on my phone when they ask about home schooling. Yeah, I'm bragging to them but now you can do the same thing! Aside from the .75 fake sprite I bought, (my kids were in Heaven or maybe just a sugar high) it was made with things I had around the house. Yes, I do keep balloons around my house. I actually have a kid that I babysit who looks forward to getting balloons at Sis. P's house. I'm like the cool aunt! Make sure you use non bendable straws. I didn't cut two holes in the lid of the bottle as the directions from the site said- too hard. Instead I put tape around the straws nice and snug. I used rubber bands to secure the balloons to the end of the straw. The directions also said to use a big balloon for the bottom of the bottle. You know, the kind with the rubber band attached that you bang back and fourth trying to annoy your brother with? I didn't have one on hand, though you can get them 3 for a dollar at the 99 cent store, so I used a plastic grocery store bag. Anyone else have a bag filled with other bags living under their kitchen sink? I put a rubber band around the bag to hold it tight as well. Then just blow into the straws and you have lungs! Perfect unexpected side effect: one balloon often would get bigger than the other. Did you know the left lung is smaller to make room for your heart? We always made sure the smaller one was on the left by turning the bottle upside down if we had to. Coincidentally I drew the left lung smaller on my human body chart by accident. Bonus! The digestive system surely has more experiments to choose from. I wasn't too thrilled with the outcome of this one, though I do think it teaches the topic very well and lots of websites have this experiment listed when teaching this concept. Here is a link that shows something like what I did. I got a gallon sized Ziploc bag and filled it half way with water. I think vinegar and a little green food coloring might have been better to show that our tummy is full of stinky (but totally helpful) acid and in my imagination that acid is green (resist the erg to google it). I used an empty paper towel roll as the esophagus and as you can see in the picture above J put it slightly in the bag without getting it wet. Then we fed it bread. Something more colorful like cheese may have been more visually stimulating. After that J used her hands to act as the muscles in our stomachs to break the food down ready to enter the intestines. We learned about the intestines on a different day though it could go along with learning about the stomach since it all makes up the digestive system. This day, however, was focused on the stomach and what goes on there. Since I'm not super enthusiastic about this one I'm giving you a bonus link that looks very nifty to try. Give THIS life size looking digestive maze of awesomeness a go. You can always make a Tee Shirt. It seems a bit strange, but it's sure to be a great conversation piece at any home school function. It would also be great reinforcement if you challenged the kids to tell about the digestive path anytime someone asked about the shirt. I can't even look at this shirt without laughing. I'd love to see a picture of one of my readers wearing their original digestive system shirt! You would totally rock in my book. I'm going to end my Human Body Series with the nervous system. This was SO simple and really neat, even for me. By now I hope you have partaken of the awesome sensation of going back and fourth between a hot tub and a swimming pool. It really stuns the nerves system. That is this experiment on a giant level. We want to make it portable and able to fit on your table top. You start with 3 bowls. In bowl 1: Ice water. Bowl 2: room temperature water. Bowl 3: hot water of the non flesh burning variety. 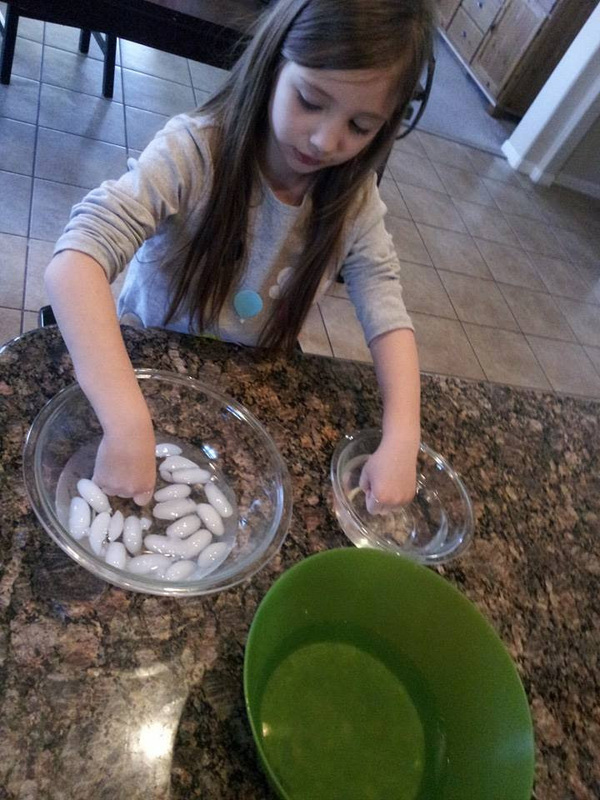 Have the student place one hand in the ice water and the other in the hot water. Keep submerged for 1 minute (3 if they have been bad that day ;-). Then place both hands in the lukewarm water. The hand that was in the ice is now very warm while the hand that was in the hot is now chilled. Easy! By the way, if you are following along on your Human Body Chart from Part 1, we colored in skin for this experiment. Ok, so I couldn't find the link where I got this idea but It's simple enough to follow the steps above I hope. And I'm also giving you THIS link for an optional idea to choose from. The human body is amazing! I didn't cover every topic we learned in our semester at home, or that is listed on the human body chart I made, but I have faith that you can come up with some one your own. Also, there is no rule that says each topic must have an exciting hands on experiment. If you comment with your email address I have an overwhelming list of resources I can send to you on the human body. I really think that this semester could be done inexpensively. To conclude this topic for now, I'll leave you with some books I kept on hand. If you have suggestions- post them in the comments below. It’s easy to make a mini-book! Just Flip and Fold! Two folds, two staples and a single cut makes a simple piece of paper into an eight-page mini-novel. A flip and fold book will not intimidate reluctant writers. Young and old alike can take a single idea and turn it into a story. Fold a piece of paper in half. Cut off the other fold with scissors. Presto! You’ve made a book! Our kids love making these books. They can be an easy-reader for the young with only one or two sentences per page or it can even be a well -developed idea put into book form. This type of book is great for new writers, they learn about the title page, where page numbers go, etc. Create a book about emotions with one word and drawing per page. Transplant a single idea from your writing journal and expand upon it. Create a collection of stories, jokes, or riddles in a flip and fold book. You can insert pictures and photographs into your flip and fold books!